Supporters of the proposed "trolley" between Bethesda and Silver Spring need to be aware of the devastating impact that a surface-level rail line would have on the Georgetown Branch hiker-biker Trail. The "trolley" is the latest incarnation of the Purple Line, the Inner Line having been selected by the County Council and the Governor. In reality, the "trolley" would be a light rail commuter train. The Georgetown Branch Trail sits in the midst of a very narrow canopy of trees and shrubs. The trail is widely used, not only by residents of the Bethesda-Chevy Chase area, but also by hikers and bicyclists from throughout the entire Washington D.C. metropolitan area, as well as visitors from across the nation. It is a part of the Capital Crescent Trail. Pick a warm, sunny day on a week-end or holiday, and you will see not a few, but quite a number of people of all ages, ethnicities, and income groups out enjoying the Trail. You will see that even now, hikers need to make way for bicyclists, and bicyclists for hikers. Sometimes the bicycle traffic is so heavy that walkers, including young children and the elderly, are forced to the very edges of the Trail. There is simply no room on the Georgetown Branch for a train. To make way for the train, which would almost certainly have to be double-tracked, virtually the entire canopy of trees would have to be removed. Furthermore, a surface-level light rail train would be extremely susceptible to varying weather conditions. One of our heavy snow falls or ice storms would quickly put such a rail system out of commission. The only way that a train could be placed along the Georgetown Branch without destroying the Trail would be to put it underground. I believe that much of the opposition to this project would disappear, if, instead of a surface-level, light rail train, we were to have a heavy rail line running underground, and connecting directly to Metro. That would be a more expensive alternative than the current plan, but it would also be an investment in the future -- providing a needed transportation link, while preserving the oasis of greenspace that is the Georgetown Branch hiker-biker Trail and linear park. As a candidate for Congress, I support the expenditure of Federal funds, to improve and expand the Metro system. Where new Metro lines would otherwise destroy neighborhoods and greenspace, Federal money should be spent to put the rail lines underground. The Georgetown Branch is one such project which merits the expenditure of Federal funds in order to save the Trail, and "bury" the rail. ***Deborah created the graphic at the top of this page as an expression of her support for the Georgetown Branch hiker-biker Trail and linear park. 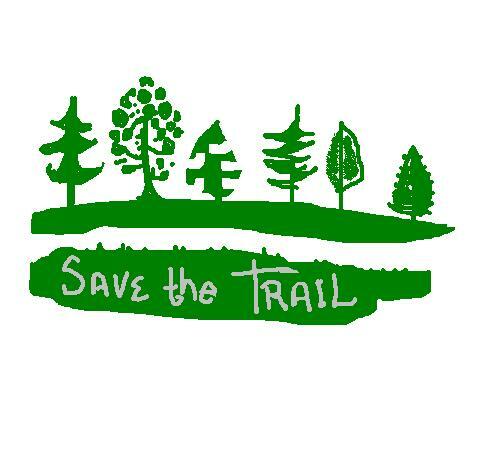 She had stickers made using this image, for use by grassroots organizations working to Save the Trail. Deborah is on the Board of one of these organizations: the Greater Bethesda Chevy Chase Coalition. Stickers are available for free from Deborah, to people who support this cause, and want to wear the sticker at hearings, rallies, and other events. Send her an e-mail with your name, address, and phone number if you would like a Save the Trail sticker.